A historic event within global Christianity is set to take place Friday as Pope Francis meets Russian Orthodox Patriarch Kirill in Cuba – the first-ever meeting between the leaders of the Catholic and Russian Orthodox churches since the Orthodox tradition broke away from Catholicism nearly 1,000 years ago. While Pope Francis has met with other Orthodox leaders, including Patriarch Bartholomew I of Constantinople, he has never met with the Russian Orthodox patriarch, who leads the largest church within Orthodoxy. Tensions between the Russian Orthodox and Catholic churches have long prevented a meeting between patriarch and pope, but a mutual concern for the persecution of Christians in the Middle East and North Africa appears to be one reason Francis and Kirill are finally coming together with plans to sign a joint declaration. 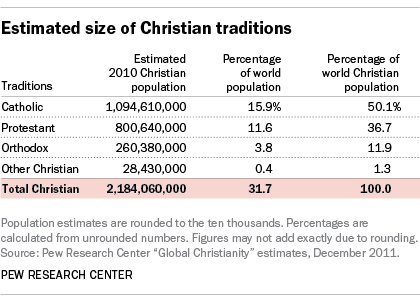 There are roughly equal numbers of Orthodox and Catholic Christians in the Middle East and North Africa, according to 2010 data from a Pew Research Center report on global Christianity. 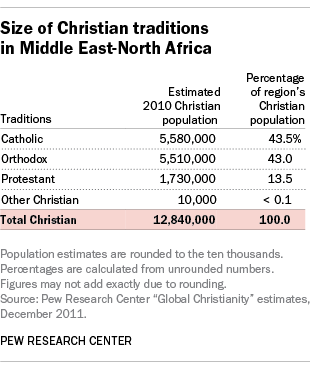 Although turmoil in the region may have shifted Christian populations in recent years, we estimated that there were about 5.6 million Catholics and 5.5 million Orthodox Christians in the Middle East-North Africa region as of 2010 – each between 1% and 2% of the region’s overall population. Lebanon has the largest Catholic population in the region (more than 1 million people, or about 29% of all Lebanese), while Egypt has the Middle East’s largest Orthodox population (roughly 4 million Egyptians, or 5% of the population), mainly members of the Coptic Orthodox Church. Although we do not have data on exactly how many people globally identify with the Russian Orthodox Church in particular, there are about 100 million Orthodox Christians living in Russia – by far the most of any single country. And their numbers have been growing over time. Since the fall of the officially atheist Soviet Union around 25 years ago, Russia has seen a dramatic rise in the share of adults who identify as Orthodox Christians, from 31% in 1991 to 72% in 2008.